Pack of 10. Suitable for Oticon Corda products such as Spirit 3 and Zest supplied through the NHS. Pack of 10. Suitable for Oticon Corda products such as Spirit 3 and Zest supplied through the NHS. 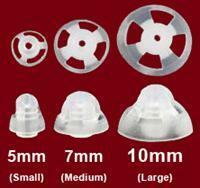 Also suitable for Oticon Epoq, Vigo, Agil, Acto BTEs if already fitted with slim tubes.